Home » »Unlabelled » Man Pushes Wife To Save Himself From A Sinking Cruise Ship. But The Reality Is Priceless. 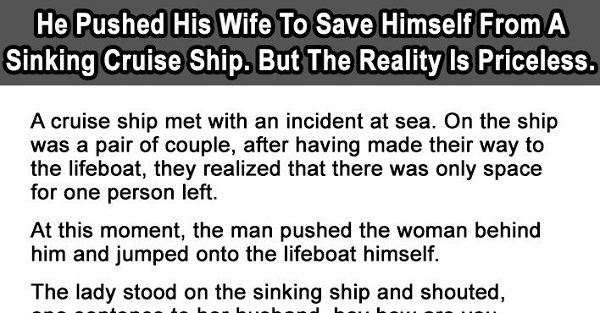 Man Pushes Wife To Save Himself From A Sinking Cruise Ship. But The Reality Is Priceless. A teacher was tutoring a class of students when she relayed a story about a cruise ship capsized while at sea, and on the ship was a couple that managed to make their way to a lifeboat but realized there was only space for one. You’ll never guess what lesson they learned from the story. A cruise ship met with an incident at sea. On the ship was a couple, after having made their way to the lifeboat, they realized that there was only space for one person left. The boy shook his head, “Nope, but that was what my mom told my dad before she died to disease”. The cruise ship sunk. The man went home and brought up their daughter single-handedly. It turns out that when parents went onto the cruise ship, the mother was already diagnosed with a terminal illness. At the critical moment, the father rushed to the only chance of survival. Those who apologize first after a fight, do so not because they are wrong but because they value the people around them. Those who are willing to help you, do so not because they owe you anything but because they see you as a true friend.